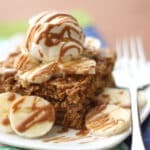 Baked oatmeal is one of my family’s favorite breakfasts. There is something irresistible about the way oats are transformed when they are baked in the oven. This oatmeal is tender and slightly chewy, reminding me of warm granola. My whole family thought that this tasted just like warm banana bread. 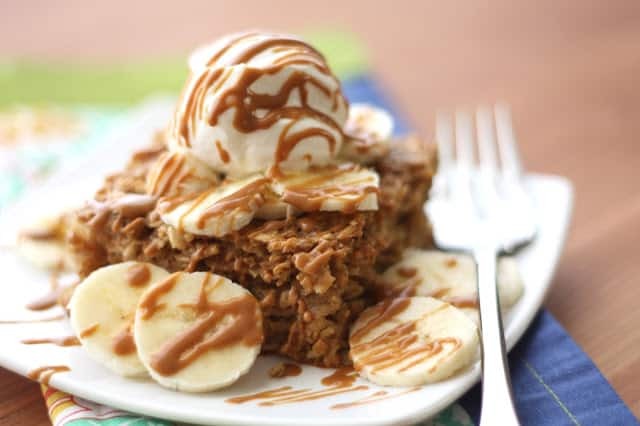 I topped each serving with a scoop of freshly whipped cream and an extra drizzle of Biscoff. This breakfast rated two thumbs up by every member of my family! Have you heard of Biscoff spread? I’m new to this deliciousness and I’m loving it! Biscoff is made from buttery sweet cookies that are transformed into a creamy, smooth spread with the consistency of peanut butter. Biscoff sent me several jars to play with and I’ve had a ton of fun creating new recipes with it. poured over ice cream, baked into blondies, whipped into smoothies, I have been playing with this spread for a while now and I’m sold on it. This creamy goodness tastes exactly like cookies! I have even been known to just dip a spoon into the jar for a late night snack. Are you looking for more breakfast ideas? Check out all of our Favorite Oatmeal Recipes! Preheat the oven to 350 degrees. Melt the Biscoff in a glass bowl in the microwave for about 20-30 seconds. Stir together all the oatmeal ingredients and pour into a well-greased 9-10" square pan. Bake for 35 minutes, until a knife inserted comes out clean. Remove from the oven and let cool for 5-10 minutes before serving. 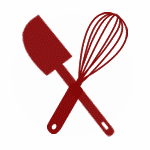 While the oatmeal is cooling, combine the cream,the powdered sugar and the vanilla in a mixing bowl and beat until the cream forms stiff peaks. Warm the Biscoff in the microwave for 15-20 seconds. 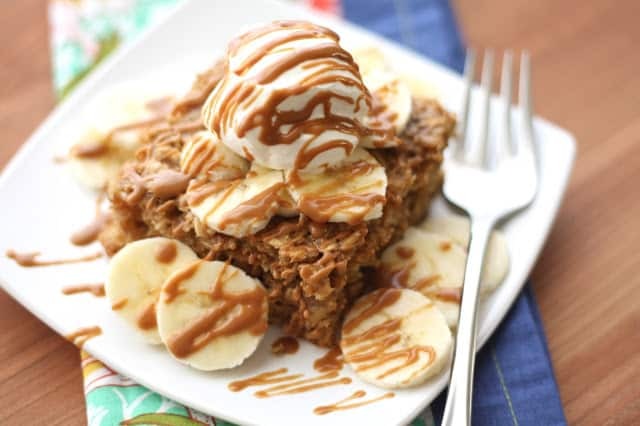 Slice the oatmeal into squares and serve topped with banana slices, a small scoop of whipped cream and a drizzle of Biscoff. Enjoy! into portions. Store the oatmeal in airtight freezer bags or containers. Reheat in the microwave with a tablespoon of water. I've heard of Biscoff before, but I have never tried it. Now I must go find some.. how could I not after the way you raved?? :) The baked oatmeal looks mouth-watering!! I've never tried it but have seen it all over the place! Looks like you transformed this lovely spread into a super creative delicious meal. I know your boys must love it! Never heard of Biscoff - sounds like it really makes this baked oatmeal.